a 62 year old female is bought into your ED following a high-speed MVA. She has driven her car into telegraph pole at ~ 80km/hr. She is haemodynamically stable, with an unremarkable primary survey. Of note, she has an obvious seat-belt abrasion over her anterior chest with significant sternal tenderness on palpation. 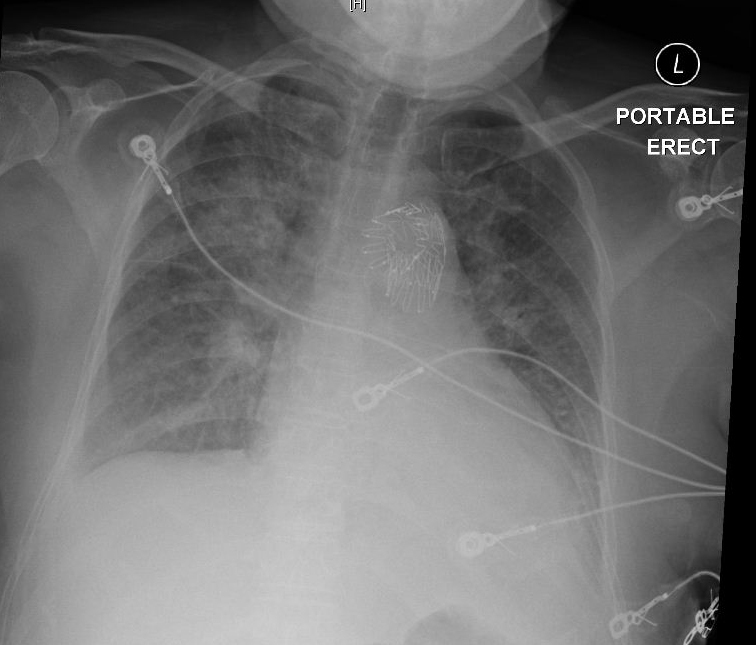 This is her mobile CXR taken in the resus-bay…. Clearly her chest x-ray is abnormal. Whilst it is a poor inspiratory film [& the patient is supine], there is an abnormal mediastinal contour which is markedly widened. The trachea is also deviated to the right side. EFAST performed: difficult study 2* to habitus. Possible LUQ free fluid. Within the next 10 minutes she is transported to radiology for a CT ‘pan scan’…. 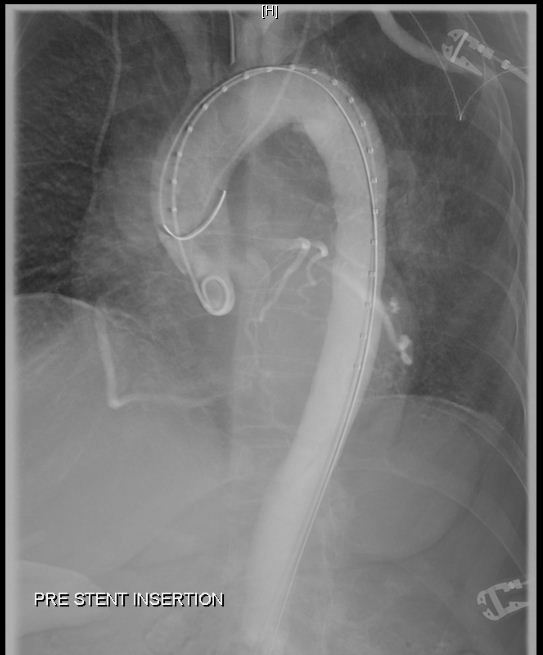 Small 16×6 mm focal traumatic aortic dissection of the inner curvature of the aorta ~1.5cm distal to the origin of the left subclavian artery. CTB + C-spine reported as normal also. … with a pulse rate of 66 per minute & a blood pressure of 172/98. What are you going to do now ?!? 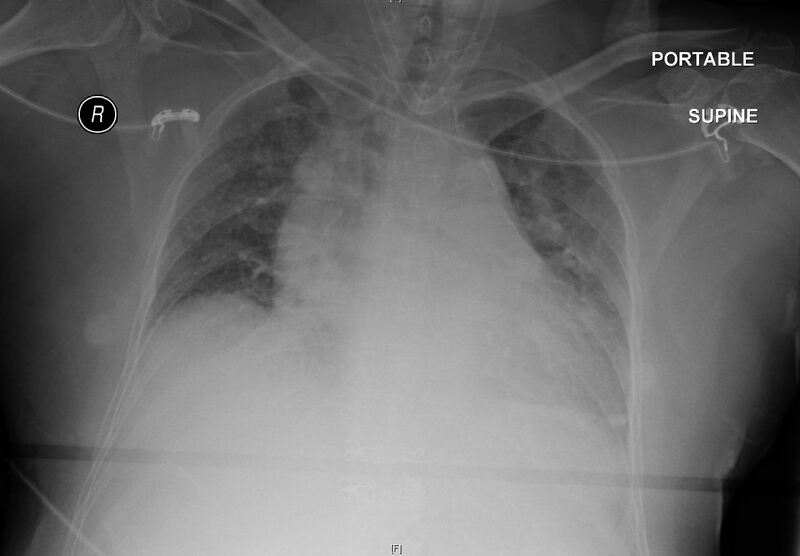 This is a trauma patient with a blunt aortic injury. Extrapolating from the non-traumatic aortic dissections, you recognise the importance of both heart rate and blood pressure control in this scenario however cannot help but question the role of β-blockers & vasodilators in a patient with pelvic fractures & an equivocal FAST scan. Blunt aortic injury is the second most common cause of death from blunt trauma following head injury. Overall mortality for those surviving to hospital evaluation is ~31%. During deceleration the mobile heart & ascending aorta swing forward and can result in intimal tearing at the isthmus, where the descending aorta is fixed to the posterior chest wall. 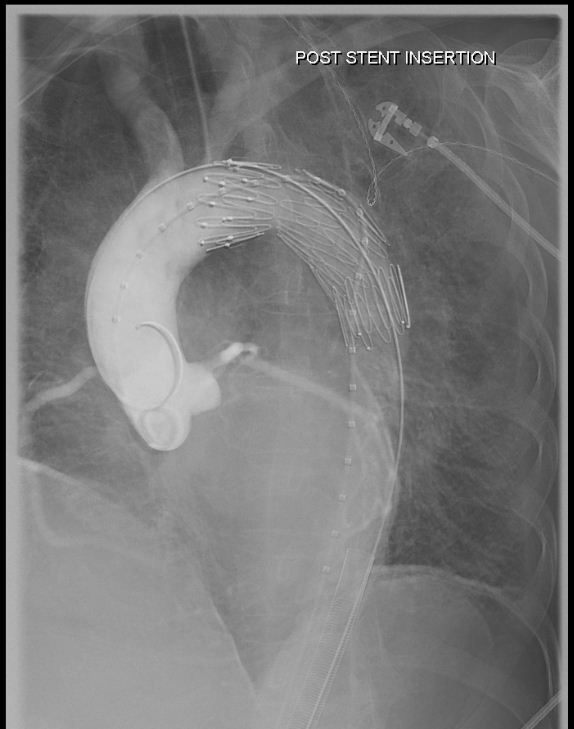 Sudden rise in intraabdominal pressure creates a water-hammer effect within the aorta. 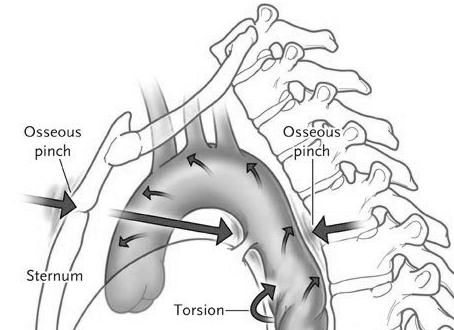 Osseous pinch results in entrapment of the aorta between the anterior chest wall & the vertebral column. 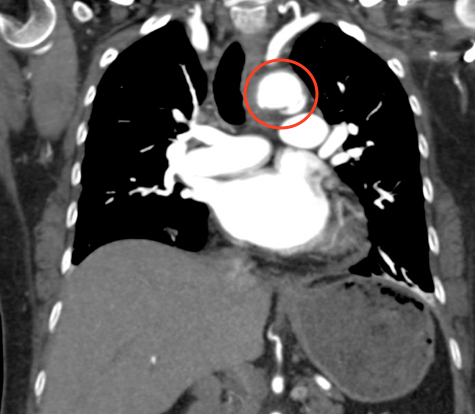 For more information on Aortic Dissection, especially clinical features, diagnostic tools and management – check out thebluntdissection – chest pain and… !! WHEN SHOULD WE SUSPECT THIS INJURY ? especially unrestrained drivers or ejected passengers. In the unstable patient, management focuses on concomitant resuscitation whilst detecting and correcting the underlying cause of haemorrhage. It is important however, to avoid over resuscitation. Careful, meticulous blood pressure control is mandatory until definitive surgical repair can be performed. If operative repair is delayed, then systolic blood pressure should be corrected to 100-120 mmHg. Whilst there are many feasible ways of doing this (depending on available medications & local practices), the key is to avoid rebound tachycardia which can increase shear stress on the intimal flap (ie. lowering the dP/dT). Therefore beta-blockers are often utilised with the vasodilator agent (eg. esmolol + nitroprusside), aiming for a pulse rate of 60 per minute. Endovascular repair has documented benefits such as reduced blood loss, minimally invasive approach, allowance for neuroprotective positioning and reduction in rates of paraplegia. A significant limitation at present is, if the aortic injury occurs adjacent to a sharp bend the graft may provide poor apposition and risks device collapse. Proximity to the left subclavian artery can also result in ischaemia and care must be taken in those with a dominant left vertebral circulation. … with the nitroprusside infusion trickling in her blood pressure gradually drifts down to 120 mmHg systolic !! Interestingly her pulse rate does not budge & you wonder if she is pre-morbidly beta-blocked. This was not clarified at the time due to language barrier. Behind the scenes, arrangements are made with Interventional Radiology and Vascular Surgery to proceed to the angiography suite. Following an uneventful procedure, she is transferred to Intensive Care for ongoing observation and tight blood pressure control. She continues to make a slow but steady recovery…. Dosios, T. J., Salemis, N., Angouras, D., & Nonas, E. (2000). 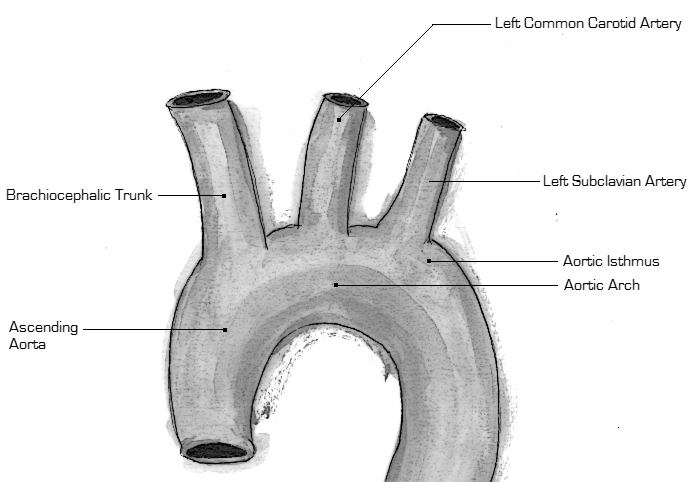 Blunt and penetrating trauma of the thoracic aorta and aortic arch branches: an autopsy study. The Journal of Trauma: Injury, Infection, and Critical Care, 49(4), 696–703. Reed KC & Curtis LA. 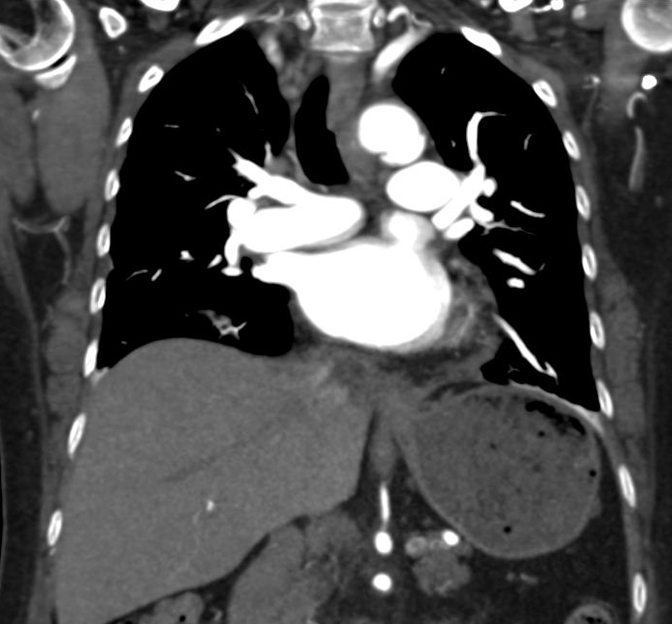 Aortic Emergencies – Part II: Abdominal Aneurysms And Aortic Trauma. Emergency Medicine Practice. 2006; Volume 8, Number 3. Nagy, K., Fabian, T., Rodman, G., Fulda, G., Rodriguez, A., & Mirvis, S. (2000, June). 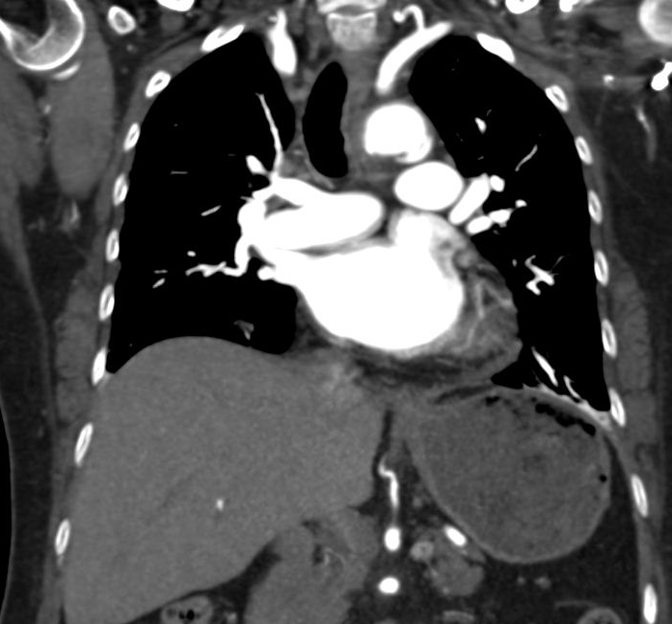 Guidelines for the diagnosis and management of blunt aortic injury: an EAST Practice Management Guidelines Work Group. The Journal of Trauma: Injury, Infection, and Critical Care. 48(6): 1128-43.